The 86th Championship, the forerunner to baseball season in Japan, started at Hanshin Koshien Stadium in Nishinomiya on March 21, 2014. In spite of cold and windy weather, some 30,000 fans watched the opening ceremony and the total attendance on Day 1 for the 3 games was over 60,000. The tournament lasts 12 days including a day of rest and is competed by 32 high schools selected throughout Japan. 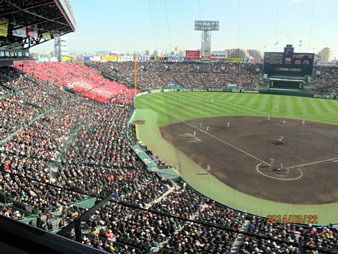 The venue, popularly kown as “Koshien” will be the main stadium for 18 Under IBAF Baseball World Cup scheduled in 2014.